Richard Kroon of Technicolor has written a definitive dictionary of 3D Terms. Since the invention of the stereoscope in 1830, stereoscopic 3D has remained on the cutting edge of the media and entertainment industry. Every 20 to 30 years, a new generation rediscovers stereo filmmaking, fueling its resurgence with additional twists introduced by the technological advancements of the intervening years. 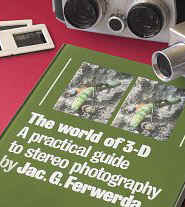 Since its first printing in 1982, thousands of copies of The World of 3-D have been sold to stereo photographers around the world. This book has been widely acknowledged as the standard text on the subject. It is the most complete and definite book presently available on stereo photography in all its practical aspects from seeing, taking, and producing. It starts out basic enough for the absolute beginner, but advances in logical steps to cover more advanced and diverse topics. With over 245 illustrations, many of which are stereo pairs suitable for free viewing or viewing with a simple viewer, The World of 3-D sets out to answer the questions that are asked by everyone who wants to make their own 3-D pictures. At the same time, it challenges the more experienced stereographer to think about what he is doing, perhaps from a new perspective. An excellent addition to this book would be the View-Master 3 reel set Jacobus G. Ferwerda - The Man of 3-D which is a good way to see the work of the man who wrote the book. 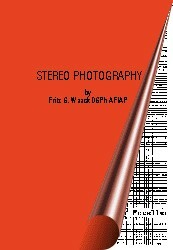 This 72 page 5" x 7" format book is subtitled �An Introduction to Stereo Photo Technology and Practical Suggestions for Stereo Photography.� This is the updated English edition of the original published in 1979 by the German Stereoscopic Society. It is packed with useful information for both beginning and advanced stereo photographers. Beginners will appreciate the general background that is provided for getting started, and the "do-it-yourself" section which shows how to make your own slide bar, twin camera rig, stereo slide and print stereo viewers. Illustrations supplement the text. Advanced stereographers will find detailed technical information including technical diagrams, and numerous mathematical formulas and tables for stereo photography calculations. A good all-around text for any 3-D library. This book is an indispensable resource for the owner of any Fed Stereo Camera. Due to the peculiarities of the Eastern European design and the rarity of the camera most repair people have little knowledge of the camera. The 7P format and the auto-exposure make this one of the most popular modern stereo cameras. The manual is an 'English' translation of the original factory manual and although accurate, does not have the highest production value. However the figures and the information is invaluable. We have included a sample page of this 22 page (5 figures) Softcover book. This 3rd Edition features more text on every subject, more illustrations including 34 full-color 3-D views, and better image quality thanks to the use of a special high-resolution continuous-tone printing process. In easy-to-understand terms this book covers everything from taking 3-D photos with a single ordinary camera to mounting 3-D slides or prints, viewing, and even projecting in 3-D. For three years the earlier editions were used for a university course in London, England. 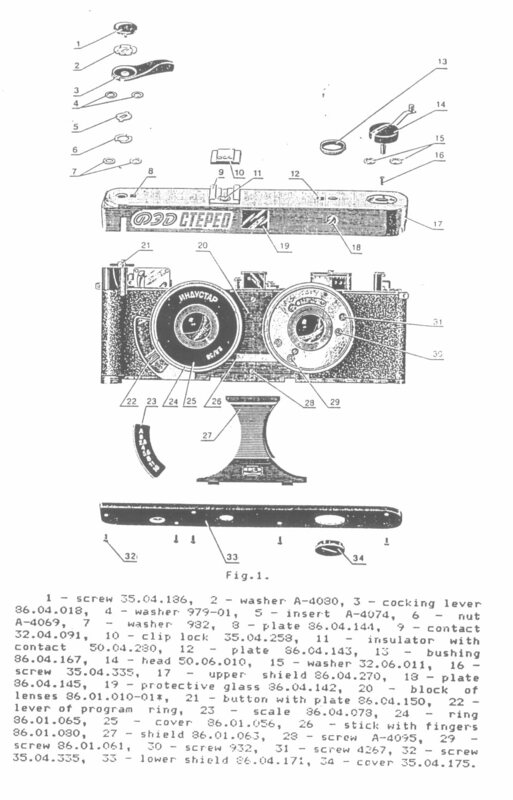 Twin cameras, stereo cameras, attachments, and even a bit of history are all included in this 32 page book. The 34 full-color 3-D views and 27 black-and-white illustrations range in subject from aerial hyperstereos to close-ups of flowers and birds, and compliment the easily understood text. 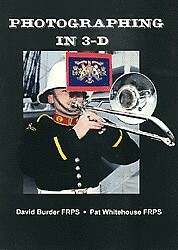 All 3-D images are suitable for free-viewing (directions included), or for viewing with an optional viewer. The book is about 5�" x 8�", printed on glossy paper. If you bought the 1st or 2nd edition of this book, you still should consider adding this beautiful new 3rd edition to your collection. If you are a beginner we strongly recommend this as a great book to get you started! THIS BOOK IS THE SECOND in a series of facsimile editions of historical 3-D works published by David Starkman and Susan Pinsky of Reel 3-D Enterprises; it follows Brown's Stereoscopic Phenomena of Light and Sight (1903), which they published in 1994. 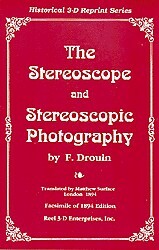 The Stereoscope and Stereoscopic Photography was written in 1894 by F. Drouin of France and first published in French. Matthew Surface (then editor of The Practical Photographer) translated it into English that same year for publication in England. Little is known about F. Drouin himself, but the high quality of his work leads us to believe he was very skilled and knowledgeable in photography in general and the 3-D techniques and equipment of his day. This book focuses mainly on the stereoscopes of that era. Drouin thoroughly describes and illustrates just about all types that were in use at that time, as well as a number of advanced concepts in stereo photography and viewing that became practical and feasible only long afterwards with the development of new technologies. The author also discusses all types of stereo photography methods (e.g., single camera, twin camera, twin-lens camera, slide bar, etc. ), as well as a brief section on bin-ocular vision and the perception of relief. David and Susan are to be commended for the superb reproduction quality of this facsimile edition of a fascinating book and thanked for their on-going efforts to provide 3-D enthusiasts with copies of these excellent historical works, in which much of the information is just as valid and useful today as it was over 100 years ago.